Cruis’n Alaska is an audiovisual installation that takes the form of a dysfunctional video game. 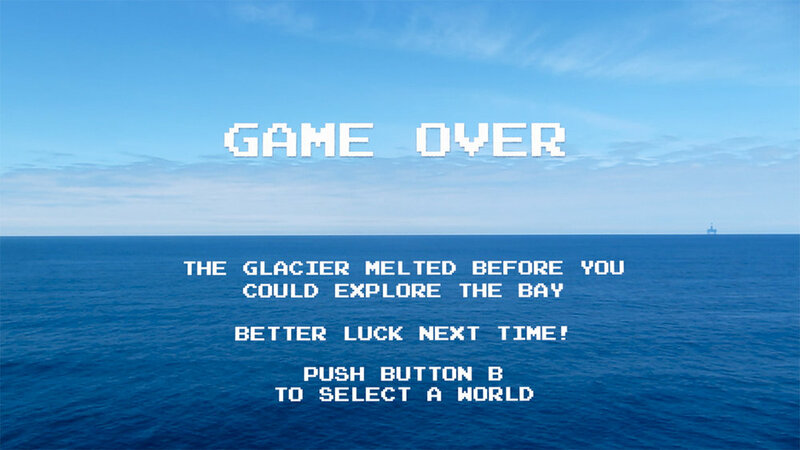 Presented via a modified Super Nintendo Entertainment System in which gameplay is stuck on an infinite “GAME OVER” screen, players are informed, “THE GLACIER MELTED BEFORE YOU COULD EXPLORE THE BAY / BETTER LUCK NEXT TIME! / PUSH BUTTON B TO SELECT A WORLD.” However, upon inspection of the controller, the B button is missing—a playful challenge to the techno-utopian belief that humans can innovate their way out of ecological disaster. The slow, somber “funeral waltz” samples the theme from Super Mario Bros.’ underwater-world, and the open water seascape footage was filmed during a cruise line tour of the Gulf of Alaska. The fictional cartridge label depicts our likeness—white, cis, hetero, able-bodied, and financially secure—acknowledging the tragic irony of this group’s simultaneous complicity in, yet insulation from, climate change and its disastrous impacts. Climate change tourism is a form of disaster tourism, similar to poverty tourism, in that it turns tragedy into entertainment. This privileged distance—of trauma that can be momentarily experienced and then escaped—is also a hallmark of video games. In Cruis’n Alaska, we co-opt this tool of distraction to suggest that individual agency lies outside of our rigged systems; in real life there is no reset button.